These adorable handmade snowman earrings are not just for the Christmas holidays! The handmade cuties don't need to be put aside when the Christmas tree is taken down, but can be worn well into the short, cold days of winter. 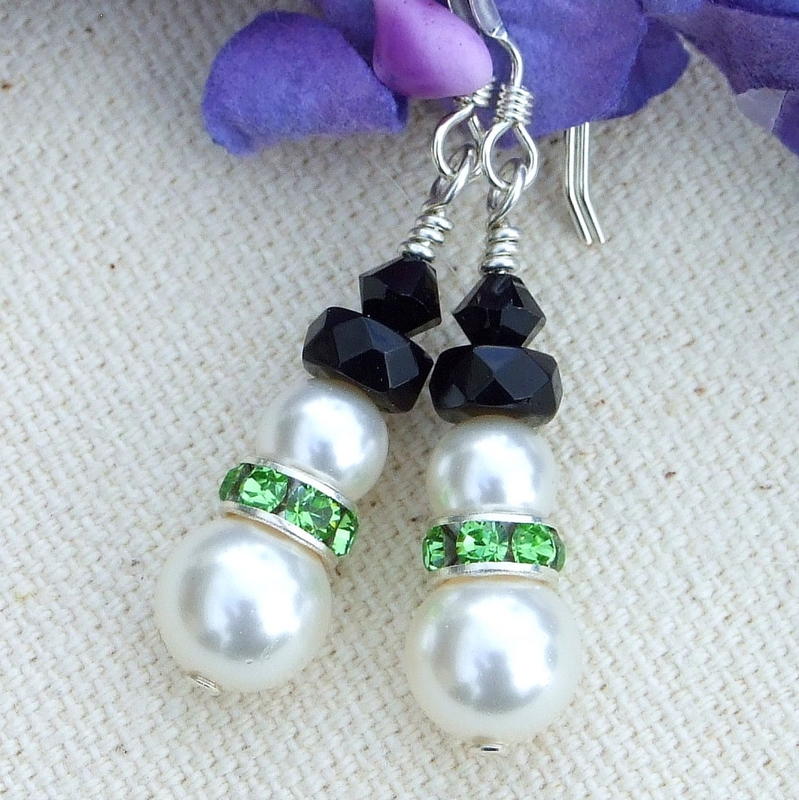 The handsome gentlemen, named SNOWMEN IN PERIDOT, were created with two sizes of glowing white Swarovski crystal pearls. To add sparkle, silver plated roundelles with embedded "peridot" green Swarovski crystals were used for their collars and faceted black Swarovski crystal rondelles and bicones were used for the top hats. The holiday earrings exude a lovely, subtle charm and can be worn to the office, with your party clothes or when you just want to kick back in casual clothes. 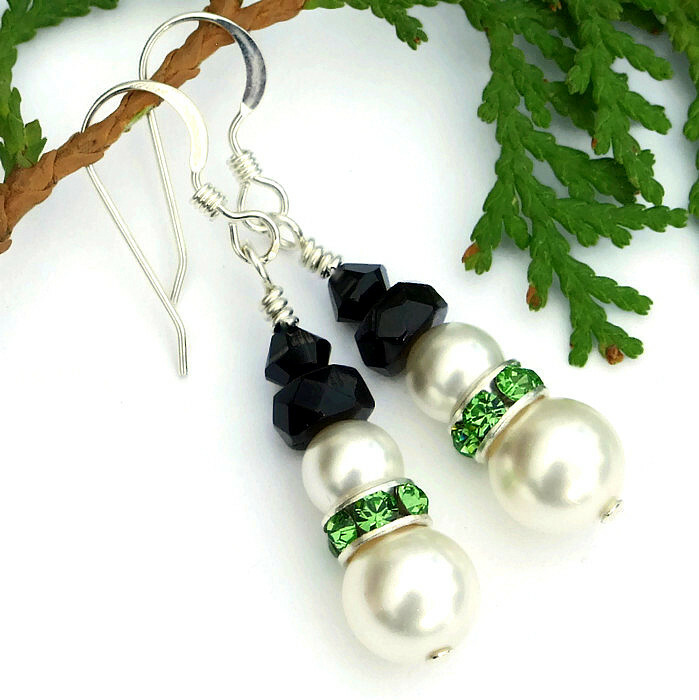 Looking like they are all dressed up for a Christmas party themselves, the SNOWMEN IN PERIDOT earrings were carefully designed and handmade by Catherine of Shadow Dog Designs. Two different sizes of Swarovski crystal pearls make up the body of the snowmen, 8 mm for the body and 6 mm for the head. And, boy, do they ever glow! If you look at the photos above, you can see my silhouette as I took the pictures. Swarovski crystal "pearls" are man-made, but unlike many synthetic pearls that use a plastic core, Swarovski pearls have a lead crystal core. Mimicking the weight of real pearls, this crystal core also allows the pearls to warm to the skin as real pearls are known for. 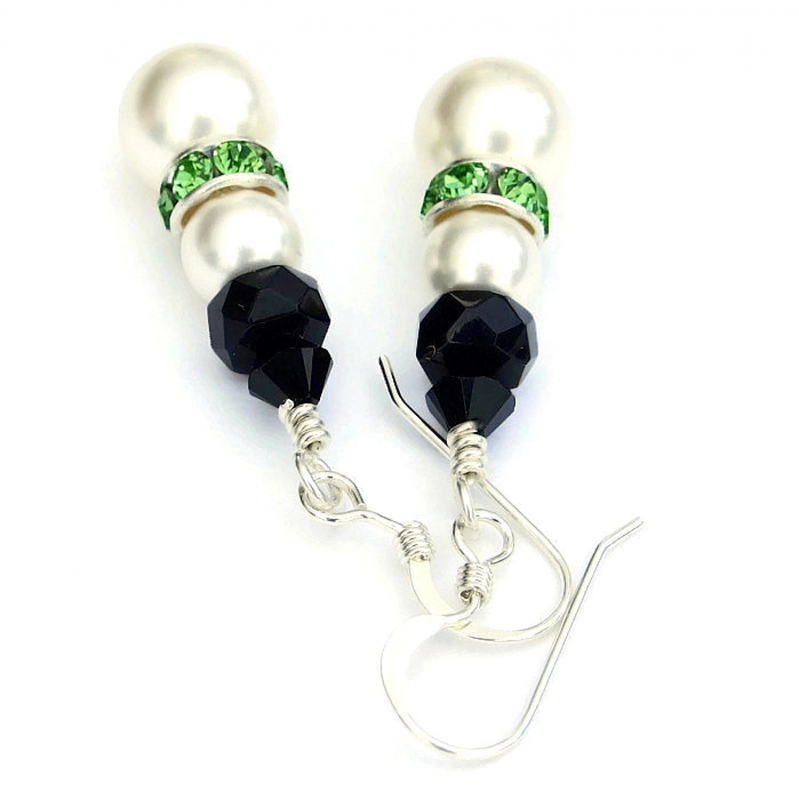 Consisting of multiple layers of luminous pearlescence (crushed pearls) that gives the look and feel of famous South sea pearls - at a fraction of the price. Giving a sparkly, whimsical look to the SNOWMEN IN PERIDOT earrings, I added silver plated brass roundelles between the head and the body. Faceted "peridot" Swarovski crystals were set in the roundelles, adding much holiday cheer in a lighter green than the "normal" Christmas green. They sparkle, sparkle, sparkle - I just wish the photos captured that. All well dressed snowmen need to wear a hat! The hats of the SNOWMEN IN PERIDOT were created with "jet" Swarovski crystals, a deep black color. To make the brim of the hat, faceted crystal rondelles were used. A 4 mm faceted "bicone makes up the crown. 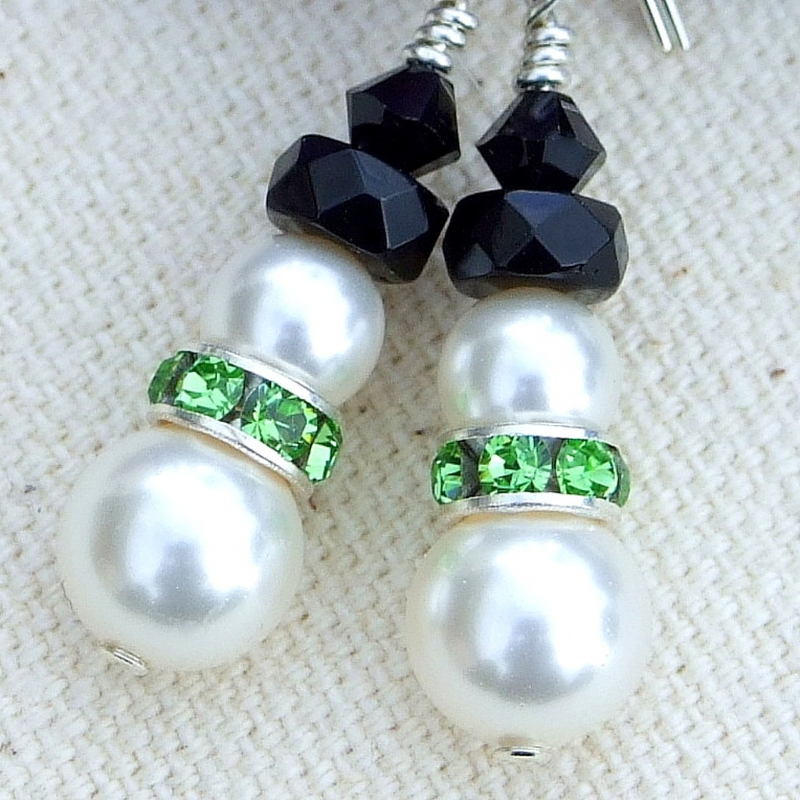 These crystals add even more sparkly goodness to the earrings! The body of the snowmen earrings were strung on sterling silver head pins. The top end was carefully wire wrapped into a loop. The loop was then connected to sterling silver French hook earwires for a perfect finish to the SNOWMEN IN PERIDOT earrings. 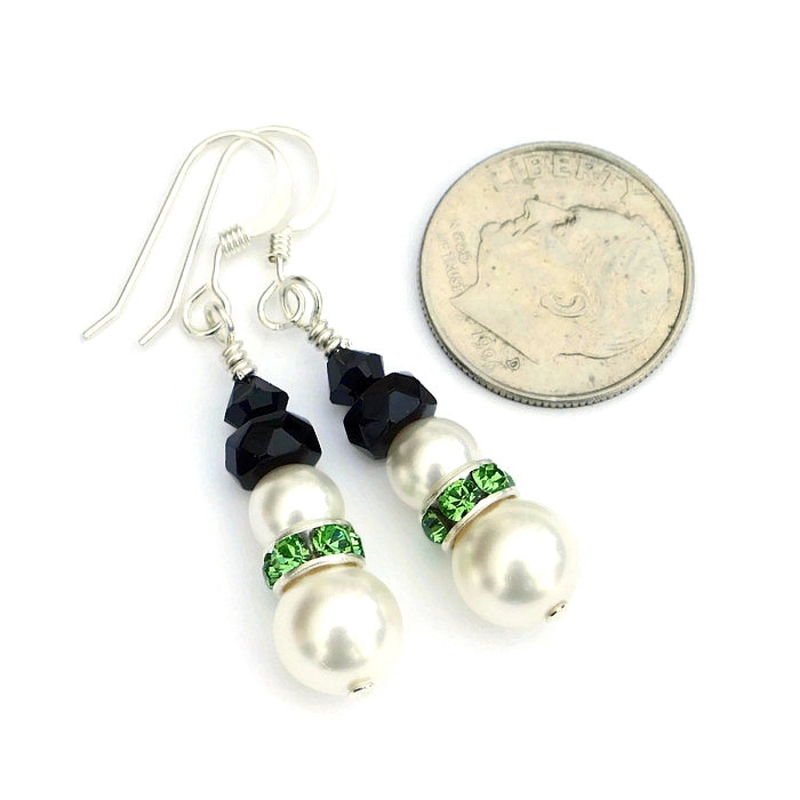 For a better understanding of the relative size of the SNOWMEN IN PERIDOT earrings, please be sure to check out photo #7 for a size comparison with a dime. Even though manmade, crystal (glass) carries the energies of transformation, rebirth and communication. Silver is believed to be a metal of love and healing; it is a mirror to the soul, helping us to see ourselves as others see us. 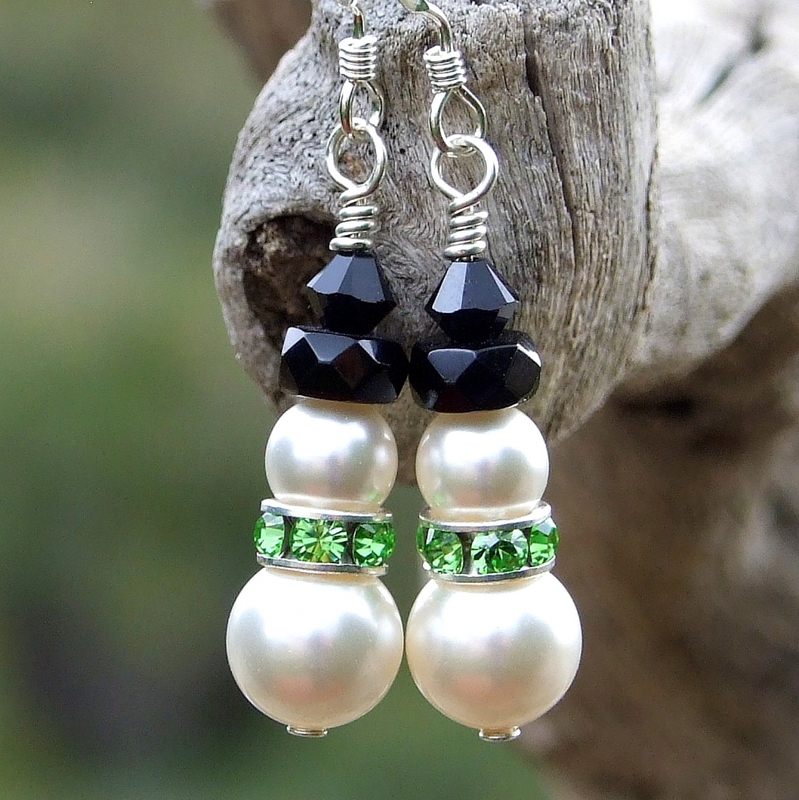 The SNOWMEN IN PERIDOT earrings will be carefully packed in an organza jewelry bag, perfect for gift giving to a loved one . . . or to yourself!